Explosion happened near location where pro-Iranian Afghani Fatemiyoun located. Unclear if explosion result of airstrike or explosives detonating within the warehouse. At least 20 dead including Iranian officers. Update 1615ET: Hezbollah-tied news media is denying any airstrikes took place. With al-Ahed reporting that the source of explosions in Aleppo was from detonating explosives, not airstrikes. According to unconfirmed reports from the Syrian Observatory for Human Rights, there have been a number of casualties following the strike. It remains unclear if those killed were Syrians or Iranians. If the latter, Iran may soon be in a state of war with Israel. Maariv reports that at least 20 Iranian Officers were killed in Aleppo due to the airstrikes. Trump’s mission in Syria may be “accomplished”, but Israel’s is just getting be getting started (as we speculated). 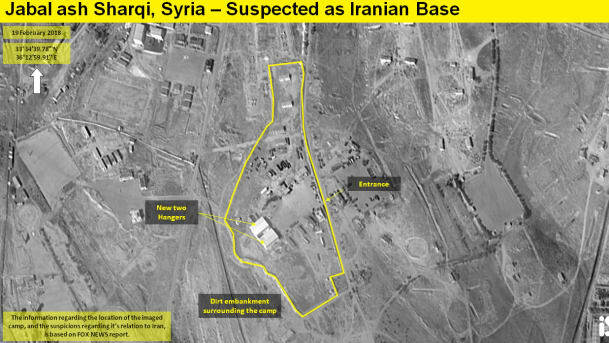 The alleged Iranian airbase was first disclosed in late February, when Fox News published images showing a military base northeast of Syria’s capital. According to the report, Iran’s Al Quds force is operating the post. While it is too early to determine who launched the attack, since none of the western forces have claimed responsibility, the most likely party is Israel which as a reminder, was also the first to strike Syria last Monday, almost a week before the US-coalition forces also unloaded on Syria.